Quick Name Search. A minimalist interface to finding files. Combines ultimate power with ultimate ease. 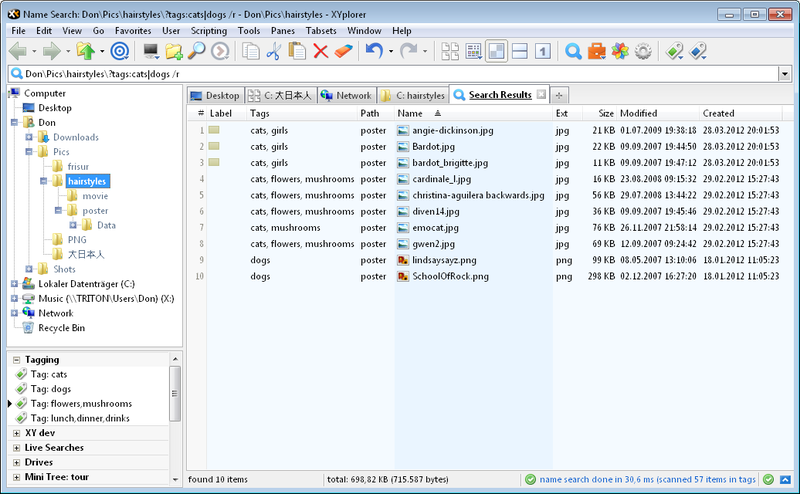 The obvious idea is to offer an ultra-smooth access to the most common find task: the search by filename. 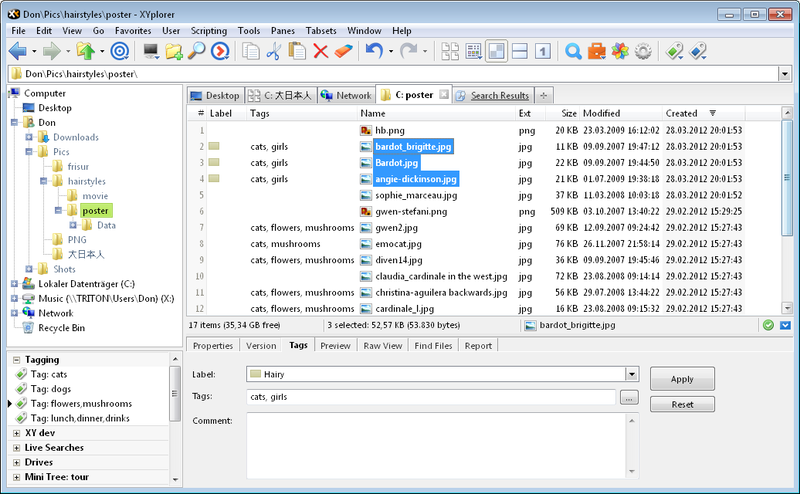 No more need to open the Info Panel, select the mighty Find Files tab, reset any previous filters, enter a pattern, and press Find Now. 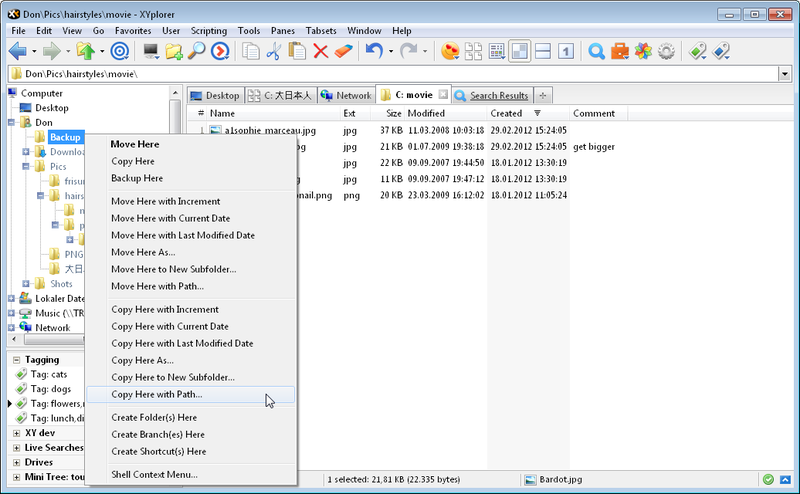 Instead you completely bypass the Find Files tab leaving its current settings unused and unchanged. Note how the pattern is repeated in the Address Bar; this allows you to immediately verify the nature of the search. The pattern is also shown in the tooltip of the tab. As an extra service there is a handy additional command Repeat Last Quick Name Search (Shift+F3). It repeats the last Quick Name Search (if any) in the current location. 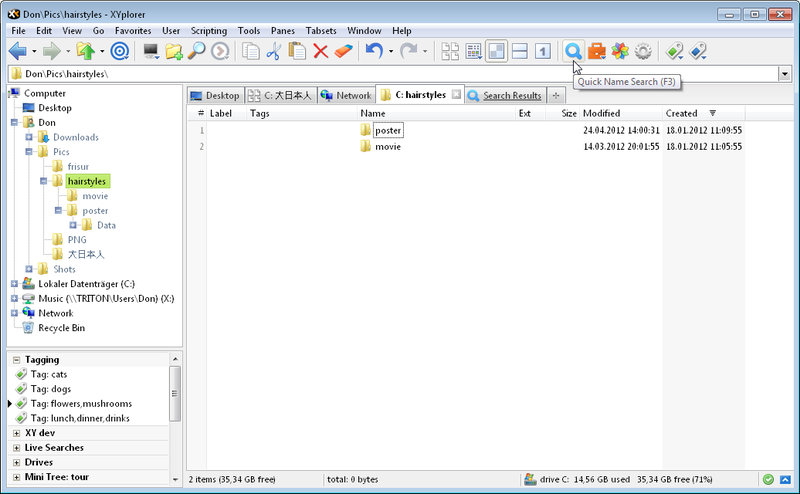 You find this command in menu Edit, and in the right-click menu of the Quick Name Search toolbar button. 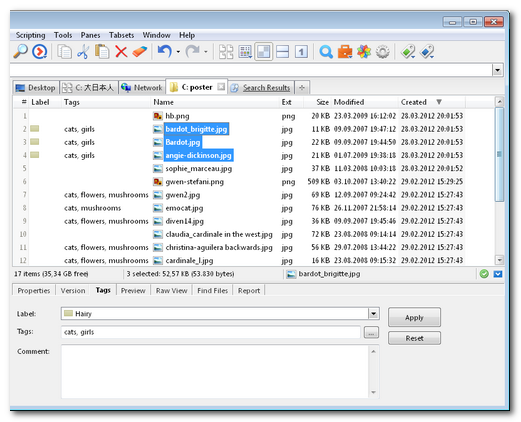 Note that the last 64 Quick Name Search patterns are stored in a most-recently-used list, available as dropdown in the dialog, and remembered across sessions. Tags Tab. 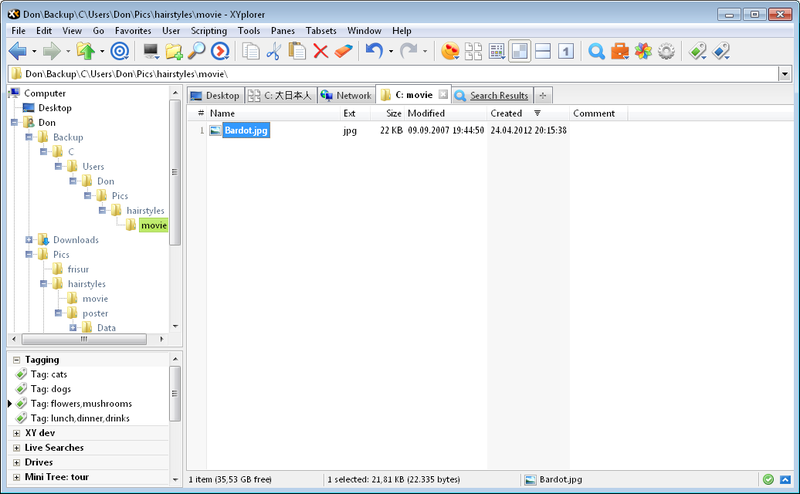 XYplorer lets you assign tags (labels, tags, and comments) to individual files and folders. The new Tags tab provides an intuitive all-in-one interface to adding, editing, and viewing the tags. Copy Here with Path. 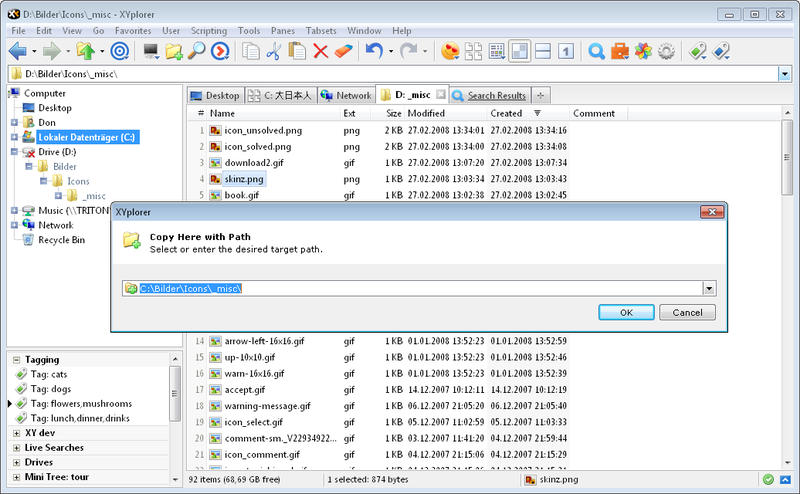 A copy command that offers you smart choices regarding the target location. 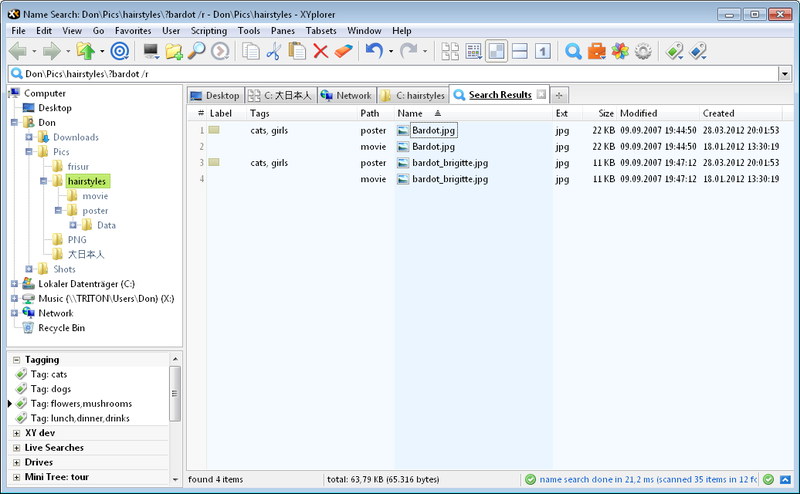 Makes it very easy to mirror copy individual items from/to deeply nested locations. 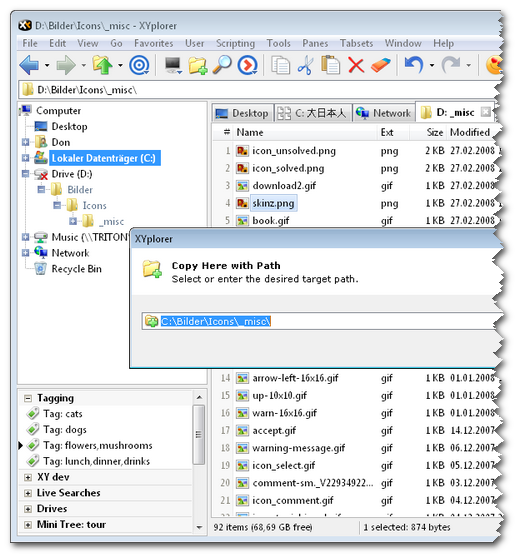 You find the command in the custom Drag and Drop context menu, and (as "Paste Here with Path...") in the Paste Special submenu. 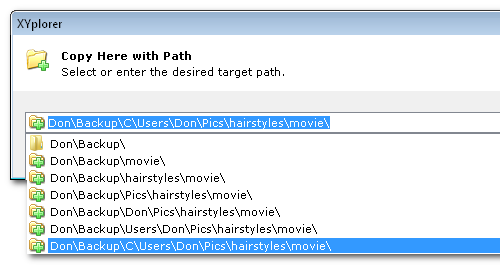 The commands open a dialog which offers you a complete set of path choices auto-generated from the drop target and the source item(s). 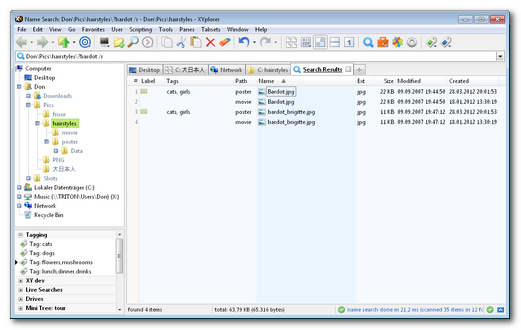 Any non-existing subpaths will be silently created in the target; non-existing paths are marked by the "New Folder" icon in the dialog. Note that in the dialog there is some smartness at work: The path which XYplorer thinks you are likely to choose is preselected. E.g., if you drag directly onto a drive root (or network share), the path that will mirror your source path is preselected. Smart Dropdown Buttons. Simply paste a plain list of documents, executables, and folders into a User Button and enjoy the power of type-aware default actions right from the toolbar. 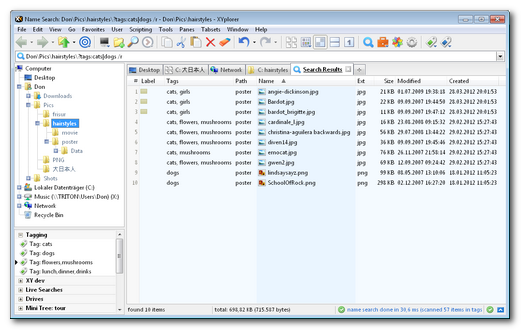 Note that the type of the listed items determines the action: The button drops a menu that opens documents, runs executables, and goes to folders. So you have a favorites panel, a launch panel, and an open panel in one place and with the least effort.